Are you tired of looking at beautiful bathrooms in home design magazines and sighing with envy, wishing your bathroom could be that gorgeous? Most of those luxurious bathrooms have a few things in common: maximizing the space, utilizing design elements to make a statement, and stocking the space with luxurious accessories to delight all of your senses. Mirrors, while an absolute must in any bathroom, can do much more than help you fix your hair. Mirrors can be an incredible design element in their own right. A large mirror can make even the smallest space feel larger by reflecting back the light and giving the illusion that the room goes on and on. If you’re on a budget and looking for that luxurious look, a mirror may be more cost effective than expensive tiling while managing to showcase the materials that you do splurge on. If you want the ultimate in modern luxury, consider swapping your dingy shower curtain for a glass shower door. Not only does a glass shower door look more expensive, it also helps to open up a space and make it feel larger. If you’re not a fan of clear glass shower doors, consider a frosted or smoky glass door for that luxury look and a little extra privacy. Tile is a popular choice for flooring and the shower/tub area, but can be used on the walls or backsplash to add a stylish feel to any bathroom. While white subway tile is certainly beautiful, there are a number of different ways to use tile to make a statement, including using larger or uniquely colored tiles or a different grout color to make your tiling stand out. A brightly painted or tiled accent wall in a bathroom can give the space character and a high-end feel without closing the space off or overwhelming other design elements. If you’re on a tight budget but want that glamorous feel, opt for a beautifully tiled accent wall to be your statement piece and finish the other walls in less expensive materials. You can also employ small pops of color here and there such as a tiled backsplash or artwork to make the space feel unique and luxurious. 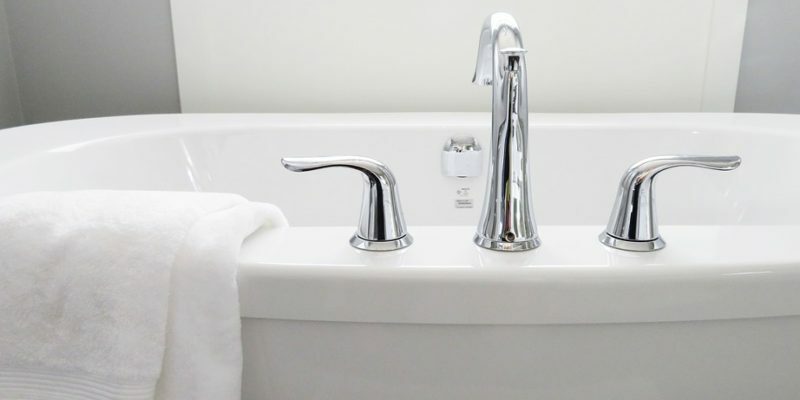 The easiest and most budget-friendly way to up the opulence of your bathroom is to splurge on some super nice bath accessories like bath towels or a new plush robe. Nothing feels more luxurious or says elegance like wrapping up in a soft, cozy towel after every shower. When we think of luxury, we don’t only think of what we see but also what we perceive with all of our senses. You can create a feeling of luxury in any bathroom with the addition of wonderfully scented soaps and lotions, a scented candle or diffuser. Greenery is a proven way to help you relax and de-stress as well as to help purify the air. Bathrooms are an excellent place to add some plants as they tend to thrive in the damp air as well as providing some personality and color into an otherwise drab space. Transforming your bleak bathroom into a luxurious and welcoming oasis is easier than you think. You just have to visually maximize the space, utilize accent pieces or color to add a dose of personality and stock your bathroom with all the luxurious goodies you love.